The suspected owner of the emaciated dogs has gone on public record as a supporter of breeding pit bulls. 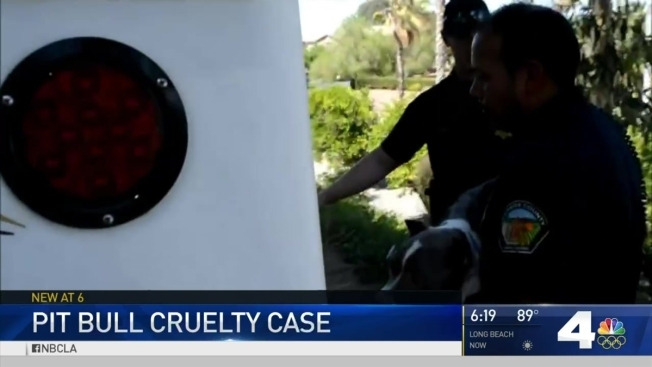 Arrest warrants were out Monday for the suspected owners of 27 starved and 12 dead pit bulls discovered at Riverside home mid-July amid a shocking animal cruelty investigation. Carl Dixon, 48, was accused of mistreating dogs in the case one animal control officer said was reminiscent of "The Silence of the Lambs." Dixon is currently serving jail time on a drug trafficking charge. The animal cruelty investigation began in the Inland Empire July 19 after 39 skeletal dogs, at least 11 dead, were discovered in a home. One of the dogs carried from the home because it was too weak to walk was taken to the veterinarian for treatment, but died, bringing the total to 12. Eight animal control officers raided the home on Avocado Lane between La Sierra Avenue and Greentree Drive after a neighbor reported a foul stench emanating from the home. "It was like rotting -- something rotting," neighbor Shirley Coe said. Malnourished pit bulls, most if not all with their rib cages visible, were found in "very bad" conditions. Some of the dogs were so malnourished they could not walk on their own out of the home. "We're talking a scene from 'Silence of the Lambs,'" said Riverside County Animal Services' John Welsh. "It was the smell of death." Investigators revealed Monday they believed the man responsible was Dixon, who had been in jail since May, meaning his pit bulls could have been neglected for months. Dixon was on animal control officers' radar after speaking publicly at a Riverside County Board of Supervisors meeting in 2013 against an ordinance to regulate the reproduction of pit bulls. Video footage of the meeting showed Dixon saying elected officials should consider the breeders who conduct themselves in a "responsible way." Dixon is believed to be in another video posted to YouTube titled "PitBull Dancing." A pit bull hangs from a rope by its jaws. The malnourished pit bulls were taken to the Western Riverside County Animal Shelter in Jurupa Valley to receive veterinary care. Some are responding positively and beginning to put weight back on. "You shake your head and say -- who does this to animals?" Welsh said. Authorities want to speak with Dixon's wife, Kim Delagos. Anyone with information on her whereabouts is asked to call (951) 358-7387.